Speed/trash metal band formed in Los Angeles, CA, in 1985 by guitarist / vocalist front man Jimmy P. Brown II. Deliverance began to amass a solid following due to their energetic live shows. 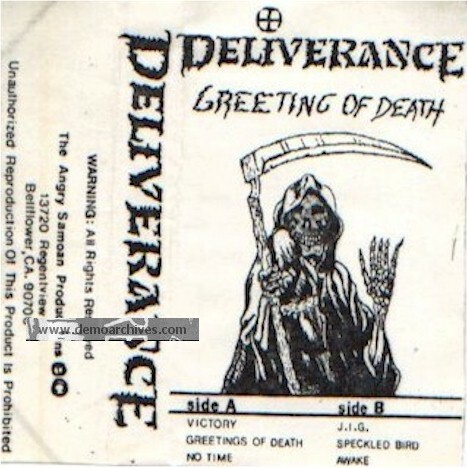 After releasing the demos 'Greetings Of Death' and 'After Greetings', the band was featured on the first 'California Metal' album in 1987, a project that looked to expose unsigned Christian bands to a wider audience. The band have been through many line-up changes, and during their career Deliverance has also included members from bands such as Mortification, Recon, Vengeance Rising and Die Happy. Jimmy P. Brown II has been the spinal cord, and only constant member.